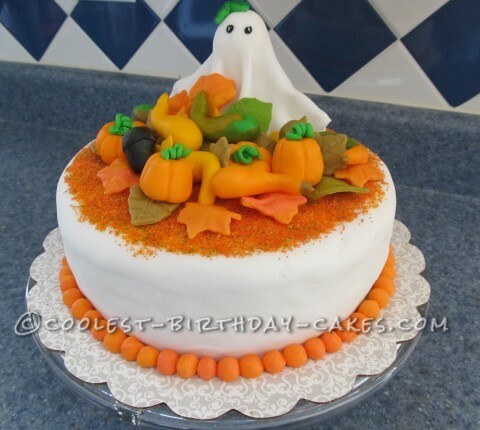 My daughter told me she wanted a birthday cake with a ghost and fall harvest. I’m not a professional baker. I’m a stay home mom but I like to bake different kind of stuff for my family and friends. The cake was from scratch, just a regular chocolate cake. I frosted it with chocolate ganache butter cream frosting and marshmallow fondant. Everything is from scratch except the board and wire to hold the ghost. Everybody loved it. They said they don’t feel like eating it because it was a very pretty cake. I don’t have any idea how to make a fruit or vegetable image out of fondant. So finally I checked YouTube just to get an idea how to do it. Finally I found one. All of a sudden while my oldest daughter was doing her lesson, I home school my eldest, I got a chance to put my hands working on the fondant images, voila! I made it, it’s not that hard as I thought. The first time you make it, it’s kinda hard but after a while it feels like similar to what you’re doing inside of your house, like cleaning and picking up something from the floor.